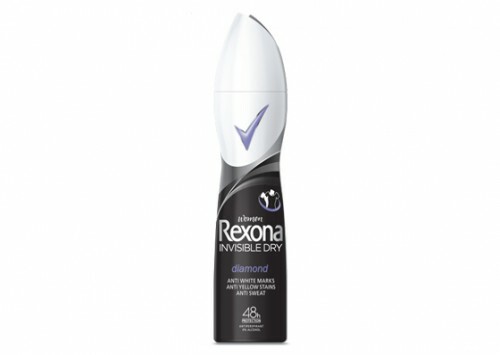 Rexona Women Diamond Invisible Dry Spray Silver Aerosol is formulated with Clearex™ technology to minimise white marks. It gives long-lasting protection against wetness and odour, and contains no alcohol so it is gentle on the skin and doesn’t sting, even after shaving. It has an energetic, fresh fragrance. I purchased this from the supermarket after finding one of my other brands of deodorant left me with white pits and staining on my darker clothes. This spray works beautifully at drying super quick on the skin, and never leaves any white residue or staining at all. The scent is nice, not too overpowering and leaves me feeling fresh. The only drawback for me was the efficacy - on hotter days I have found this has a fairly limited life, and after exercising, I definitely need a top-up. Not a huge deal considering it is a quick spray and go with no drying time, but does mean I need to have one on hand at work. This was my favourite of the Rexona range. Often the other sprays left a white streak down my clothes, so it was exciting when the diamond invisible dry spray came out. I shook the bottle and sprayed it on to my clean body and underarms, about 15cm away. It was great that my black clothes or any other clothes didn't show up with white marks. I also went hours without sweating, which was great. I stopped using Rexona now, but if I really had to I think I will go back to using it. It's also affordable and often I see them on sale. Tips: Spray it on after showering. Without a doubt, a fabulous product! This is my go to deodorant. I wear a lot of dark colours for work and have never had any marks show up. It dries a lot faster than a roll on and you don't need to use a lot. I've found I am still feeling fresh after a day at work and also that the smell is not overpowering like some other deodorants. Great product, highly recommend it. I found that while this spray left me dry for the whole day and it didn't mark my clothing (unlike other Rexona sprays I've tried), it was quite harsh on my skin. This left me feeling like my under arms were clogged rather than breathing. Not a pleasant feeling. So I bought this deodorant for the first time about a month ago, mainly because I was getting sick of the smell of my old one but anyway.. This does what it says. Quick to dry and invisible indeed. I like it that I do not have to wait for this to dry before putting on my top or dress and the best bit is that it does not leave any white streaks on my clothes. Keeps me fresh all day as well. Cannot leave home without this. Would recommend. I bought this product for $5 from the supermarket and it's worth it. It is invisible like it said no stains or marks like it said it would. i use this everyday and I love it. Rexona's known for its anti perspirant sprays and roll ons.With regular sprays you would normally get a white powdery film under your arms when spraying. But this formula is said to be invisible and it is. This spray comes in a 100ml spray can . Its a tall long can that's black and white with Rexona on it. I find the nozzle on this can easy to use. On the back of this can it has the instructions of how to apply it. The texture of this sprays just a normal liquid but it's clear. I like to apply this after I've had a shower. I wear a lot of Black clothing and normally with any other sprays I would get staining in my under arms on my clothes. Finally a spray that hasn't stained my clothes. It lasts me all day long. I don't need to apply more . I managed to get mine on sale at the time, but I think for its price its reasonable. One can lasts me a little over a month. This is one of my deodorant favourite sprays. I grabbed this deoderant on impulse really, it was on special and I liked the look of the black and white aerosol can, it's a bit sporty chic looking. The scent of this deoderant is quite light and inoffensive, it's a fresh soapy floral scent that kind of reminds me of talcum powder. 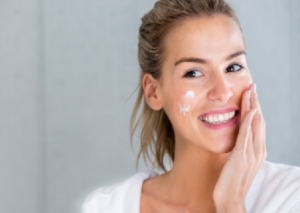 It dries almost instantly upon contact with the skin, and seems to keep me dry for around 24 hours.. I tend to sweat quite a lot under the arms and if I apply this deoderant in the morning, it's not until the next morning that I notice perspiration beginning. No marks on my clothing, no stinging, no fume suffocation when spraying.. No complaints. It's a very decent, standard & affordable every day option.